Dilutions | Dilution Calculations for Pharmacy Students! 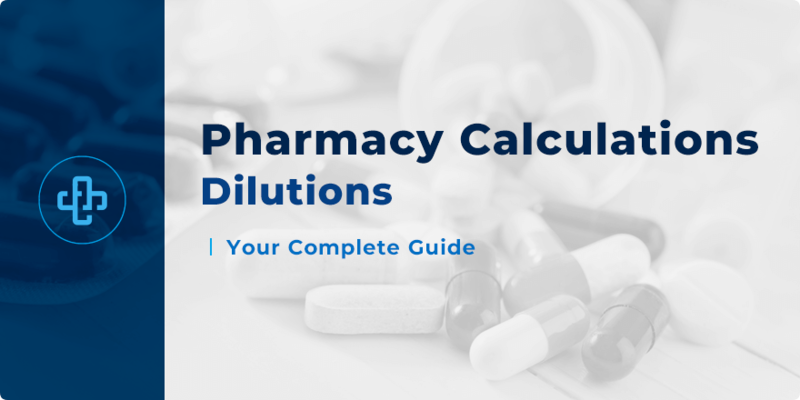 Dilutions are an important topic in pharmacy calculations. With the dilution of a medicine, drug concentration changes. As a pharmacy student, it’s vital, then, that you have a solid understanding of the implications that a dilution has, and how to calculate concentrations after a dilutions have taken place. Though this review of dilutions is not intended to be exhaustive, it does provide a solid platform upon which you can further develop your knowledge of this important topic in pharmaceutical calculations. When we dilute a medicine, the active ingredient quantities remain unchanged. However, the concentration of the medicine changes. For example, a solution containing 100mg of active ingredient in 200mL of vehicle has a very different concentration if we add a further 200mL to the solution. After all, adding additional solution disperses the active ingredient through a greater volume. If we administer 5mL of the medicine to the patient, he/she now receives less active ingredient – meaning an impaired clinical and therapeutic impact. That’s why dilution calculations are so important and why the pharmacy student must have a thorough, comprehensive understanding. Medicine X contains 2g of the solid ingredient within 500g of product. A further 250g of vehicle is added to the product. Find the concentration of the diluted mixture as a percentage strength, a ratio strength and an amount strength (in mg/g)?. The amount of active ingredient remains the same i.e. 2g. However, the total amount of product changes to 750g. Answer – the diluted product has a percentage strength of 0.27% w/w, a ratio strength of 1 in 375 w/w and an amount strength of 2.7 mg/g. 100mL of a 1 in 50 w/v solution is diluted to 1000mL. Find the concentration of the diluted product as a percentage strength, a ratio strength and an amount strength expressed as mg/mL. By convention, 1 in 50 means 1g in 50mL. If there is 1g in 50mL, there is 2g in 100mL. After dilution, the amount of active ingredient remains the same (2g) and the total amount of vehicle becomes 1000mL. We need to convert mg to g and hence ‘a’ = 2mg. Answer – the final solution has a percentage strength of 0.2% w/v, a ratio strength of 1 in 500 w/v and an amount strength of 2mg/mL. Stock solutions are concentrated solutions. By using a stock, a medicine can be prepared by simple dilution. Keeping stocks has the secondary benefit of having to keep less product in the dispensary. Let’s review some basic stock calculations. What volume of a 1 in 400 v/v solution is needed to produce 5L of a 1 in 2000 v/v solution? Let y mL be the volume of 1 in 400 solution needed. From the second pair, we find that x is 2.5. By placing 2.5 into x for the first equation, we find y to be 1,000. Answer – 1,000mL of the 1 in 400 mixture is diluted to 5L to produce a 1 in 2000 product. What volume of a 40% v/v solution must be used to produce 500mL of 5% v/v solution? Let y mL equal the volume of 40% v/v solution needed. There is also x mL of ingredient in 500mL of the 5% v/v solution. From the 2nd set, we find that x is 2.5. We can now place 2.5 into the first proportional set and find y to be 62.5. Answer – 62.5mL of the 40% v/v solution is needed to produce 500mL of 5% v/v solution. To what volume must 250mL of a 25% w/v solution be diluted to produce a 10% solution? First, calculate the amount of ingredient in 250mL of a 25% solution. Let the number of grams of ingredient in 250mL of 25% w/v solution be x. By convention, 20% w/v solution has 25g of ingredient in 100mL of solution. We find that x is 62.5. After dilution, the amount of ingredient stays the same i.e. 62.5g. We find that y is 625mL. Answer – We need to dilute 250mL of a 25% w/v solution to 625mL to produce a 10% w/v solution. Concentrated waters – such as rose water, peppermint water and chloroform water – are used to produce single-strength solutions. For example – they are used to dilute in the ratio 1 part concentrated water to 39 parts water; to produce a single strength product, then, we take one part concentrate and dilute it to 40 parts water. Suppose we have to produce volumes of single-strength chloroform water (50mL, 100mL, 200mL, 300mL, and 500mL) from chloroform water concentrate. Since chloroform water concentrate is 1 part in 40, we take 1mL and dilute it to 40mL with water in order to obtain single-strength chloroform water. Once we understand the nature of the dilution – 1 part in 40 – we simply need to multiply out that value in a proportional set. Weighing ingredients less than 100mg is challenging. Invariably, quantities this low cannot be weighed with sufficient accuracy. A trituration can, though, provide the means to deliver the concentration of ingredient we need. How would you prepare 100mL of a preparation to the following formula? We determine then that y is 10,000 micrograms or 10mg. How do we weigh 10mg? We don’t. We perform a trituration instead. We find x to be 1,000. Answer – as we can only weigh 100mg of hyoscine hydrobromide, we need to make this up to 1,000mL with chloroform water to get the required strength. The Pharmaceutical Codex states that powders must weigh a minimum of 120mg. If the amount of drug in a powder is less than 120mg, we need to include an inert powder to bulk the powder up to the minimum weight. Prepare 5 powders each containing 100mg of paracetamol. To prepare 5 powders – each containing 100mg of paracetamol – we need to weigh 500mg of paracetamol and add it to 100mg of diluent. This mixture is then divided into 5 powders of 120mg. Prepare 7 powders each containing 0.37mg of drug. At 2.59mg, we cannot weigh this – it’s less than 100mg of drug. Instead, we need to modify the proportional set by dividing 100mg (a value we can weigh) by 0.37. Dividing 100mg by 0.37mg gives us 270.3 (a value we will call ‘z’). We now need to multiply diluent and total weight by z to find values for d and e.
Answer – We would have to make enough for 270 powders – diluting 100mg of drug with 32,336mg of diluent. We now advance onto the next topic – multiple dilutions. This involves calculating the amount of ingredient needed when we’re only given the final concentration and the degree of dilution involved. Let’s review some examples. What weight of ingredient is needed to produce 1,000mL of solution such that, when 2.5mL of it is diluted to 50mL of water, it gives a 0.25% w/v solution? First, consider the 0.25% w/v solution and let y be the weight of ingredient in 100mL. By convention, 0.25% w/v means 0.25g in 100mL. We find that y is 0.125. We take 2.5mL of the original solution, increasing its volume to 50mL. The amount of ingredient stays the same – that is to say, y – meaning we get proportional sets that relate the weight of ingredient in 50mL to the weight in 2.5mL. By inserting y and solving for z, we arrive at a value of 50. Answer – the original solution is 50g of ingredient made up to 1,000mL with water. What weight of substance X is needed to produce 500mL of solution, such that when 25mL of this solution is diluted to 4000L, it gives a 1 in 2,000,000 solution? Begin by converting liters to milliliters – ensuring all units are equivalent. This gives us 4,000,000mL. We find y to be 2. We took 25mL of the original solution and diluted it to 4,000,000mL. We know that 25mL contains 1g of substance X because we have only increased the volume and the amount of ingredient remains the same. We can find z to be 40. Answer – 40g of substance X is dissolved in water to produce 500mL of solution. How many milliliters of a 1 in 80 w/v solution are needed to produce 500mL of a 0.02% solution? By convention, 1 in 80 refers to 1g in 80mL and 0.02 w/v refers 0.02g in 100mL. Let the number of milliliters of 1 in 80 solution be y and let the amount of ingredient in 500mL of 0.02% solution be x. The amount of ingredient in grams in y mL of 1 in 80 solution is also x. We find that x is 0.1. Substituting into the first pair of proportional sets, y is found to be 8. Answer – 8mL of a 1 in 80 w/v solution is needed to producde 500mL of a 0.02% w/v solution. There are cases where two or more strengths of product are mixed at stated volumes and the final concentration must be calculated. What is the final % v/v of a solution if 200mL of 40% v/v solution is added to 300mL of 70% v/v solution? The two volumes are added together to produce the final volume of 500mL. We find that x is 80. We find that y is 210. The total volume of ingredient in 500mL of final solution is 290mL. We find that p equals 58. Answer – the final solution is 58% v/v. A suspension is provided in two strengths – 100mg/5mL and 25mg/5mL – which can be mixed together to produce intermediate strength products. What proportion of the two mixtures do we need to produce a strength of 75mg/mL? This means we need 2 parts 100mg/5mL solution and 1 part 25mg/5mL solution to produce a 75mg/5mL solution. What proportion of 90% v/v and 50% v/v ethanol mixtures produces a 70% v/v mixture. Once we use the formula (above) V1/V2, we determine that the ratio is 1/1. Answer – We need to mix 1 part 90% solution with 1 part 50% solution to produce a 70% v/v mixture. Pharmacy calculations don’t need to be difficult. Before you attempt any question, try to visualize what it is that you’re being asked. Have a clear idea of concepts such as volume, ingredient, diluent, concentration, strength, ratio – knowing how the act of a dilution impacts each of these factors. Dilution calculations require practice but, with the right approach, they can quickly become a reliable means to score well in your next pharmacy calculation exam.